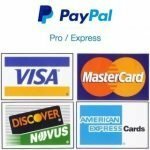 There are two basic types of grill lights on the market today clip on and handle mounted, we will go in depth on both of them here. Each is suited well for different types of grills. 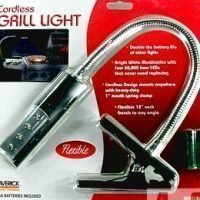 The first thing you need to know is that almost all of the grill lights out there today are battery operated so they are cordless. 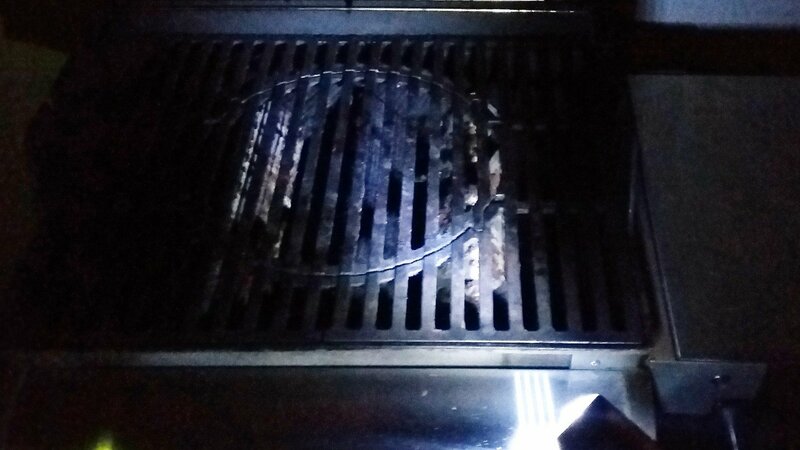 Grilling in the dark is difficult but there is a tool to help you: The grill light. There are two basic types of grill lights on the market today and we will go in depth on both of them here. Each is suited well for different types of grills. The first thing you need to know is that almost all of the grill lights out there today are battery operated and cordless. What this means to you: If you live in an area where it gets below freezing it (or at least the batteries) will need to be removed and brought inside every time it gets cold. If it is left to freeze best case the batteries will die faster, worst case the batteries will freeze and leak destroying the internals of the light. These were the original grill lights, they have a simple pressure clamp that can be operated with one hand for ease of use. Depending on the brand the flexible neck will range from 6 to 18 inches in length. The idea is to clamp this onto your side table and using the flexible neck to get the light in the position that you want. 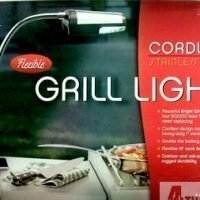 These lights were a revolution for grilling at night. However on a gas grill they always seem to be in the way. If you wanted light your grill surface they had to be clamped to the front of your side table. Then to get the light into the proper position you had to bend the neck into the grill every time you opened the lid and move it out of the way every time you closed it. and into the grill when you opened it. It was just a lot harder then it needed to be. Since on a gas grill these lights will clip onto your grills side table if you use a grill cover they will need to be removed every time you cover your grill. Fortunately it only takes a second to install or remove this type of grill light. This is all assuming that the clip would open wide enough to clip onto your grills side table to begin with. Don’t get me wrong even these grill lights have evolved over the years with larger clamps and longer necks. However on a modern gas grill with wide side tables they will do a better job of lighting your side tables then your grilling surface. To be fair this a clip on grill light has it purpose outside of lighting a side table. For example: if you use a grill like a Weber Kettle grill with no side table these lights can clip onto the side handle easily and be adjusted to light the entire surface of the grill. Provided that you are careful when you are removing the lid, it will stay in place through the entire cook. So they work really well for that type of grill. 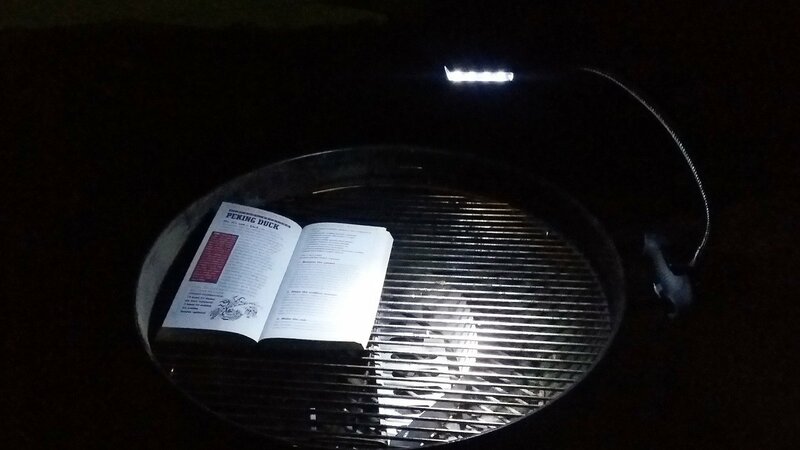 This type of grill light is has a lot more uses when not grilling to. 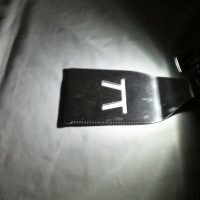 Use it light up your patio table, as a dim indoor light or as an emergency work light. It really can be used anywhere you can clip it on. 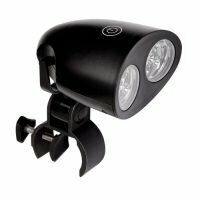 Typically a handle mounted grill light will wrap around the handle with some sort of circular or C type clamp. Most grill hoods have a handle that is long enough that the light can be installed off to one side so as not to interfere with where you normally grab it and if you have a large gas grill you can mount one on each side of the handle to light the entire grilling surface. 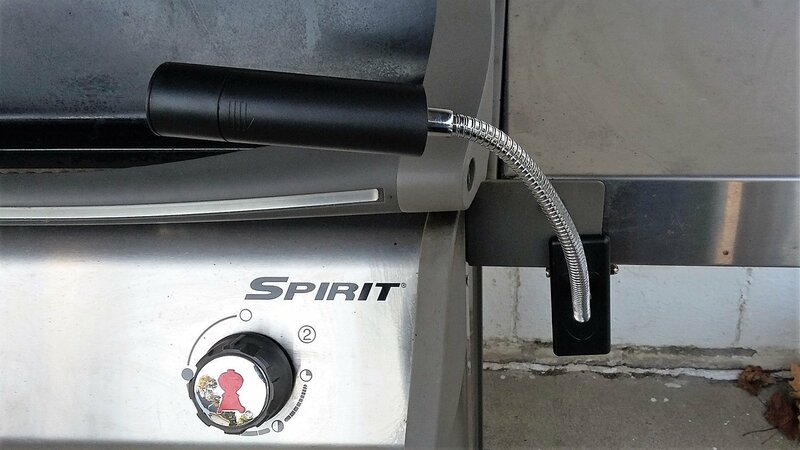 A good handle mounted light may be left on your grill when it is not in use and can easily be tucked under the grill cover. If it is getting below freezing outside, most have an easy to access battery hatch for easy battery removal and some will pop right off, leaving the mount in place. This allows you to remove the entire light and bring it inside. A grill light will help you cook in the dark especially in those winter months when the sun sets early. Some grill lights clamp onto your side table while other mount onto the hood handle of your grill. The clamp-on type grill lights work well but need to be removed to put your grill cover on. This means they have to be remounted and adjusted almost every time you use your grill. They also take up room on your side table. The handle mounted grill lights make much more sense on a gas grill. They mount out of the way on the hoods handle taking up very little room. When you open your grill the light shines on the cooking surface, letting you see what you are cooking and not your side shelf. Typically you can remove the light from the clamp easily, keeping the clamp where you want and out of the way. About the author: Mike is the owner of 4thegrill.com, a Certified Food Safety Professional and KCBS member.